Interstate 280 joins I-80 and the North Jersey suburbs in Morris County with the Oranges, Newark and the New Jersey Turnpike (I-95) in Hudson County. The 17.04-mile long freeway heads southeast from Parsippany-Troy Hills Township across Hatfield Swamp into Essex County at West Essex Park. Continuing through the borough of Roseland, I-280 ascends across Second Watchung Mountain into West Orange Township. Turning southward, I-280 descends abruptly from First Watchung Mountain into the City of Orange. The freeway lowers below street level and parallels the NJTransit Morristown Line along an urban corridor into East Orange and the city of Newark at Roseville. Passing north of University Heights, I-280 partitions through a wye interchange (Exit 13) with the unbuilt Newark Midtown Freeway (New Jersey Route 75). Elevating across southern reaches of Branch Brook Park, Interstate 280 proceeds east by Downtown Newark. The freeway spans the Passaic River across one of the few lift bridges in the Interstate System. 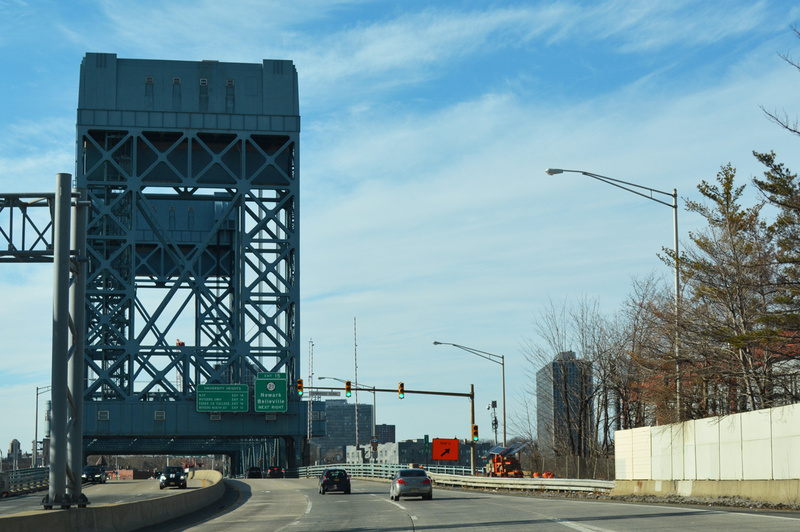 The William J. Stickel Memorial Bridge connects Newark with the borough of East Newark and the town of Harrison. I-280 runs along side the Northeast Corridor Line and Path transit into the town of Kearny. The urban loop concludes at ramps to both the West and East Spurs of the New Jersey Turnpike amid wetland areas along the Hackensack River. Westbound Interstate 280 at the William J. Stickel Memorial Bridge crossing the Passaic River at East Newark. Photo taken 08/29/05. Interstate 280 curves northeast from the adjacent Passaic River to the New Jersey Turnpike. A three quarter cloverleaf interchange (Exit 17) connects the freeway with County Route 508 east to Jersey City and west into Kearny. Button copy signs here were replaced by 2012. Photo taken 06/13/05. Exit 17B loops onto County Route 508 (Harrison Avenue) west ahead of the New Jersey Turnpike toll plaza. Photo taken 06/13/05. Exiting the toll plaza, motorists along I-280 east partition into ramps for the New Jersey Turnpike Eastern Spur to Union City, Hoboken and the Lincoln Tunnel and the Western Spur for the Meadowlands, Hackensack and the George Washington Bridge. Photo taken 06/13/05. The succeeding trumpet interchange connects I-280 east with Interstate 95 (New Jersey Turnpike) south to New Brunswick, Trenton and Philadelphia, Pennsylvania and the Western Spur north to Interstate 80 and U.S. 46 at Ridgefield Park. Photo taken 06/13/05. The New Jersey Turnpike split into the Western Spur (I-95W) and the Eastern Spur (I-95) north of the exchange with U.S. 1/9 Truck in Newark. The Western Spur connects with Interstate 280 at a trumpet interchange (Exit 15W). Photo taken 06/26/05. The NJ Turnpike Western Spur (I-95W) advances one mile north across the Passaic River to Interstate 280 west at Kearny. Photo taken 06/26/05. Exit 15W departs from the Western Spur northbound for I-280 west to Harrison, Newark and the Oranges. Photo taken 06/26/05. The Western Spur of the New Jerse Turnpike (I-95W) lines a causeway by Sawmill Creek Wildlife Management Area leading south to I-280 at Exit 15W. Photo taken 08/29/05. Interstate 95 continues south from Exit 15W and I-280 at Kearny to Newark, Elizabeth and Linden. Interstate 280 crosses the Passaic River to areas north of Downtown Newark in 3.1 miles. Photo taken 08/29/05. Edwards and New Roads stem north from Interstate 280 at Exit 1 to U.S. 46 near Pine Brook in Montville Township. The remainder of I-280 west defaults onto Interstate 80 westbound in 1.75 miles. Photo taken by Chris Elbert (07/06). Ramps from U.S. 46 west and I-280 west form a distributor roadway along Interstate 80 westbound extending 2.3 miles to the exchange with I-287 at Parsippany. Photos taken by Chris Elbert (07/06). An end sign for I-280 stands at the wye interchange with Interstate 80 west between Troy Hills and Lake Hiawatha. Interstate 80 and parallel U.S. 46 travel west from Parsippany-Troy Hills to Dover, Netcong and Columbia. Photo taken by Chris Elbert (07/06). Ramps from I-287 north and Smith Road form a distributor roadway along eastbound Interstate 80 through Parsippany-Troy Hills Township. A slip ramp (Exit 45) follows for Beverwyck Road to Lake Hiawatha. Interstate 280 branches south in 0.75 miles. Photo taken 06/13/05. Exit 47A departs from both the I-80 mainline and the c/d roadway east of Beverwyck Road for Interstate 280 to the Oranges and Newark. Photo taken 06/13/05. A left side ramp departs from the I-80 eastbound roadway to Interstate 280 at Exit 47A. Photos taken 06/13/05. The c/d roadway continues beyond Exit 47A for Interstate 280 to U.S. 46 east to Pine Brook. Interstate 280 reaches West Orange Township in six miles and the city of Newark in 13 miles. Photo taken 06/13/05. Interstate 280 (New Jersey). NYCRoads.com (Steve Anderson).